Cast Iron pans have a reputation of being high maintenance, but don’t let the daunting cleaning instructions deter you from this essential purchase. Durable and versatile, the cast iron pan is the ultimate kitchen staple, providing you with cooking (and nutritional!) benefits. You get a nice little arm workout, because they’re HEAVY! 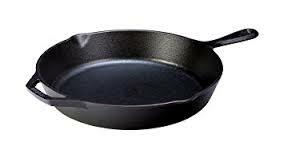 Spend a few minutes learning how to season and clean your pan so that you can avoid rust. Buy two! Keep a separate cast iron pan for fish. Since iron is porous, it’s best to keep a separate fish pan. Need some inspiration? Try our cast-iron roasted salmon recipe to break in your new pan.